Actually, we have no such motto. When I mentioned my printer to another friend recently, her eyes got big and she became excited and spoke with affection about her exact same printer. So it’s not just me. The built-in obsolescence that exists with most equipment today is alarming. 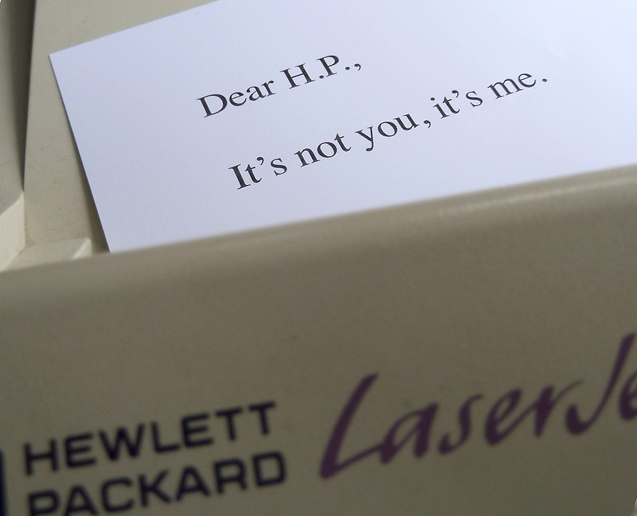 My printer — the HP 4MV — was considered one of the best laser printers ever made. Through every CPU and operating system upgrade the printer never faltered. It rarely delivered an error message, and when it did, it was like the little hiccup we all get after swallowing too hard. Paper jams? Not much. But as Q said in the final episode of Star Trek Next Generation, “All good things must come to an end.” Okay, it was an English proverb but Star Trek is way cooler, plus it fits neatly with the subject of technology. You can take your stuff only so far on the path of life. What can start as a source of pride — mindful use, good enough — can become a burden, a dust collector, a blockage. Broken or half-functioning things can bring energy-sapping juju. I’ve invested a lot in you. At the time—which was how many years ago?—you were a hot commodity. Everyone wanted you. Yes, you’d been low maintenance for years. “A real workhorse,” I’d brag to my friends. You were the topic of cocktail party conversation with colleagues. I felt proud that we’d been together so long. Righteous, some might argue. Your inner workings were only of slight interest to me — shallow, I know — and we functioned well that way, you and I. But then things changed. You wouldn’t communicate clearly. Nothing was black and white with you anymore. I couldn’t understand what you were trying to say. So I went deep inside and I didn’t like what I saw. You were more complicated than I’d given you credit for. Too complicated I’m afraid. Yet I invested even more in you. Did you appreciate it? For a little while maybe. Sure, I can still turn you on but it’s just not enough. I need satisfaction — more than you’re able to give. I convinced myself I was doing the right thing by staying with you even after you got sick. But I just don’t have the strength anymore to carry you up and down the stairs for treatment. I’m not as strong as you think I am. And your daily shroud of dust is too painful a reminder of our flagging relationship. Lastly, I want to say that I know you were hurt when I brought H.P. Inkjet home. And I apologize if you felt replaced. But I was desperate for someone who expressed himself more clearly. You will always be my first love though. If it makes you feel any better, I am not fooled by his colorful personality. I can already tell that he’ll never outlast you, not by a million years. I think you send this to HP!! Great job with the words Jane! As I stare at my printers…yes, plural. I have acquired some “stopgaps” while my 8500 decides if it still has the will to live till the end of its toner cartridge (there are no more of those), or will just refuse paper nourishment and beg for release now. So, now there are 4 sitting around here….funny how the old ones are heavy, solid. And the newer ones just such fly weights. Made to leave barely an impression on your life before landfilling…. Four! I have only one now. Two was one too many! I’ll take mine to to a volunteer-run place called Free Geek. $350 but I’m too lazy to tell it.